1. Male panthers are simply referred to as “panthers.” However, female panthers are generally called “she-panthers.” Baby panthers are known as cubs. 2. A fully grown male panther can weigh as much as 250 pounds or as little as 100 pounds. When standing, it can measure as high as 8 feet from the ground. 3. Panthers can leap as high as 20 feet. 4. 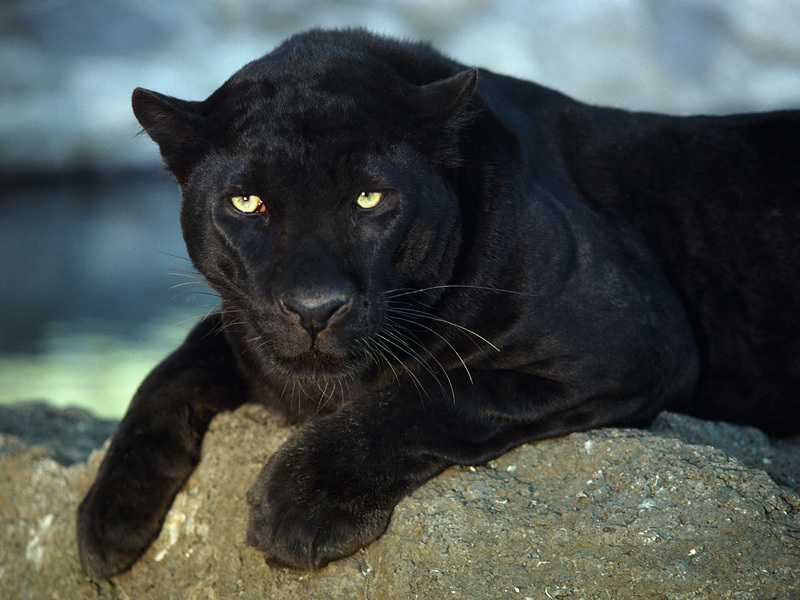 The panther can mainly be found in ecosystems like grasslands, tropical forests, and swamps. They are mostly found on the continents of Africa, Asia, North America and South America. 5. Since panthers are carnivores, they mainly eat other animals, including deer. But they also enjoy eating rabbits, birds, rodents and other creatures. 6. The panther is the most skillful tree climber in the big cat family. They can even carry their prey (after they have killed it) into a tree with them so they can eat it. 7. Panthers have been known to prey on larger animals, such as antelopes and giraffes. 8. There are three other types of big cats that are in the same family as the panther. They are the tiger, lion, and jaguar. 9. The top speed that a panther can run is about 35 miles per hour. 10. In South Africa, the African Leopard (another name for the panther) is listed as a “threatened” species according to the US Endangered Species Act. For the rest of the African continent and the Asian continent, these animals are considered “Endangered.” 11. There are two main types of panthers – black panthers and white panthers. There are other subcategories of panther as well, but these two are the main categories. 12. Because they are so quick and stealthy, panthers are often referred to as the “ghost of the forest.” These characteristics help them catch their prey quickly and efficiently. 13. White panthers are very rare. There are only a few hundred that exist in the world today. They are mainly found in Pakistan. 14. The average lifespan of a panther living in the wild is about 12 years. However, when living in captivity, they can live 20 years or more. 15. By the age of 2, a panther is living on their own and they have their own territory. 16. The Florida panther is a subspecies of the panther. There are only about 70 of them alive today, which is twice as many as were alive 20 years ago. 17. The most serious threat to the Florida panther is suburban development. Sprawling housing developments are driving the panther population away. 18. The gestation period for panthers is about 3 months. When giving birth, a female panther typically delivers between 2 and 4 cubs. The mother then takes care of the litter by herself. 19. When a panther cub is born, their eyes are closed and they have some light fur covering them. 20. Panthers can begin catching medium-sized prey at the age of 9 months.